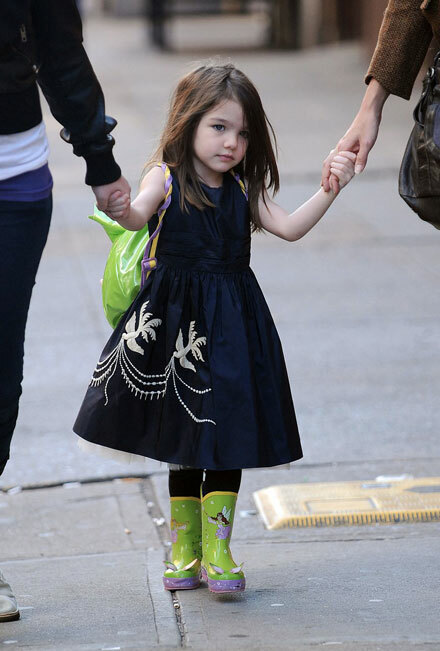 Having a $3+ million dollar designer wardrobe at 3, throwing tantrums over a real mink coat, being allowed to eat cupcakes for breakfast and draw pictures on mahogany paneling of the walls, Suri Cruise is definitely one of the most unusually lucky toddlers on the planet. Can you believe this girl is only three? The reports claim, Tom is doting on Suri letting her do anything she wants, while Katie is concerned her beloved child can someday turn into a super spoilt brat nobody will want to be around. I think I take Katie’s side. Suri is spoilt though still adorable. And she’s still the only toddler I know that wears kitten heels at such a tender age.